Pool Medic offers a wide range of pool repair services in the Myrtle Beach, SC area to suit your pool and pool area needs and problems. Think your pool has a water leak? Pool Medic can detect your leak through surface or underwater dye testing or with state of the art sonar testing equipment to find the exact location of your water loss. Once the leak is located, Pool Medic will complete the necessary underground or underwater pool repairs to restore your pool to its working order and our consultation fee will be credited against any work completed. Pumps, motors, filters, fittings, piping, drains, and more...We fix it all! Whether it’s a motor that needs replaced, directional valves installed, or new pool lights mounted, Pool Medic can do it, and more! 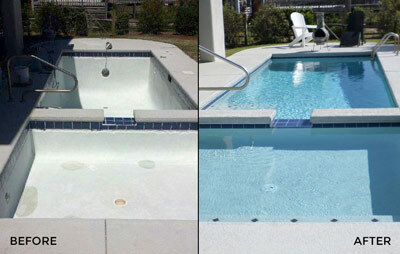 Plastering or re-surfacing concrete pools using Florida Stucco's 3M Quartz / Florida Gem colored plaster. Re-grouting tile along the water line of the pool. Replacing or re-grouting the pool coping around the edge of the pool. 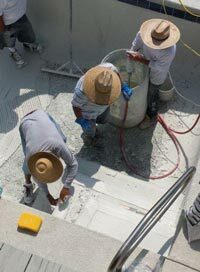 Remove, install, repair or pour new concrete pool patios, walkways, steps, and pavers. Along with our pool repair and pool construction services, Pool Medic can assist in the design and build of in-ground concrete pools. Turn your backyard into an outdoor oasis with a new in-ground spa or pool with salt or chlorine sanitizer system. We have designed and installed new in-ground pools throughout the Myrtle Beach, SC area including Surfside Beach, Garden City, Pawleys Island, Murrells Inlet, Socastee, and surrounding areas. Tell Pool Medic what your dream is and we will make it come true!